In 2013, Rhode Island conducted the largest per capita and most synergistic celebration of children’s health this country has ever seen. Let’s keep the momentum going in 2014 and have the smallest state again provide the biggest impact on children’s health in the country. And then, after we’ve shown that we can make a difference in Rhode Island, let’s take this celebration to the nation. We hold pep rallies to get kids excited about football. We assemble to remember that character counts. It’s time to do something to get kids excited about their health. And so Eat Healthy RI was created. In last years event, formerly known as the All State Read, over 75,000 students at more than 200 schools, libraries, and youth programs throughout the state participated in the Statewide Reading event of Is Your Hair Made of Donuts? And this year, we are thrilled to announce that businesses throughout the state of Rhode Island will also be participating in Eat Healthy RI. 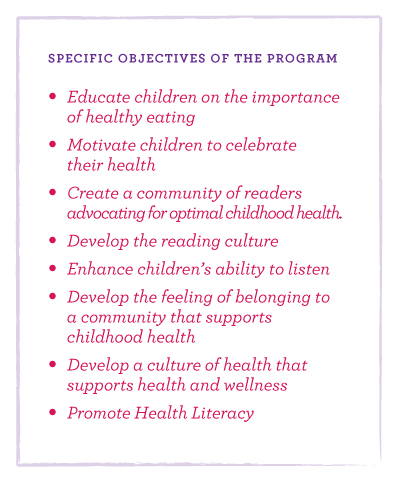 Please join us as we launch our 2014 campaign to educate children on the importance of healthy eating with new and innovative programming that expands upon last year’s event. The Boys and Girls Club of East Providence provided administrative support. 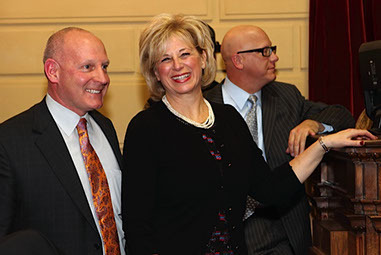 On March 12, 2013, The Rhode Island General Assembly, (The Senate and the House of Representatives) honored Joy Feldman with a Congratulatory Resolution for her work promoting healthy eating among children, championing children’s nutrition and organizing the statewide reading. Joy Feldman has developed a clever and entertaining way to help children understand that what they put into their bodies really does matter. I’m glad so many of our state’s children have been able to hear her message and learn about the importance of eating nutritious food. "The All State Read of Is Your Hair Made of Donuts? helps us as a community to focus in on awareness around healthy eating for children at a young age." Great way to make learning fun! Reading Is Your Hair Made of Donuts?, a book all about nutrition is important in a time where children’s health and obesity are significant issues. The All State Read helps to highlight and incorporate the essential healthful ideas into wellness lifestyles for our young people. "This event was exciting and important because it was a Collaboration – Members of the community all across the entire state were all involved. It was not only happening at the district level, but the state level, focusing on healthy nutrition which is important to the schools and to the children." I was honored to be a part of such a wonderful day with a grrrreat message. Count me in for next year! An outstanding event where all students gathered, excited and passionate to learn about eating healthy! The highlight of the event was the importance of the message that was delivered- - healthy eating and excellent nutrition conveyed to children across the state in many different settings. Congratulations on a successful statewide event. The All State read is an excellent combination of two positive concepts: a.) promoting reading and literacy; b.) teaching nutrition, good health and eating properly. It is a clever idea! What better way is there -- to get in front of kids and talk to them about a positive message. Thank you for making a difference, Joy! I am so proud that UNFI was able to help! day participating in the read as well. Health, wellness and nutrition is an important topic that can unite a whole school and community together, while still being fun. Thank you Joy for providing this opportunity to our school! **Image and hat design protected under Copyright Joy Feldman 2012 - 2015 "Is Your Hair Made of Donuts?"